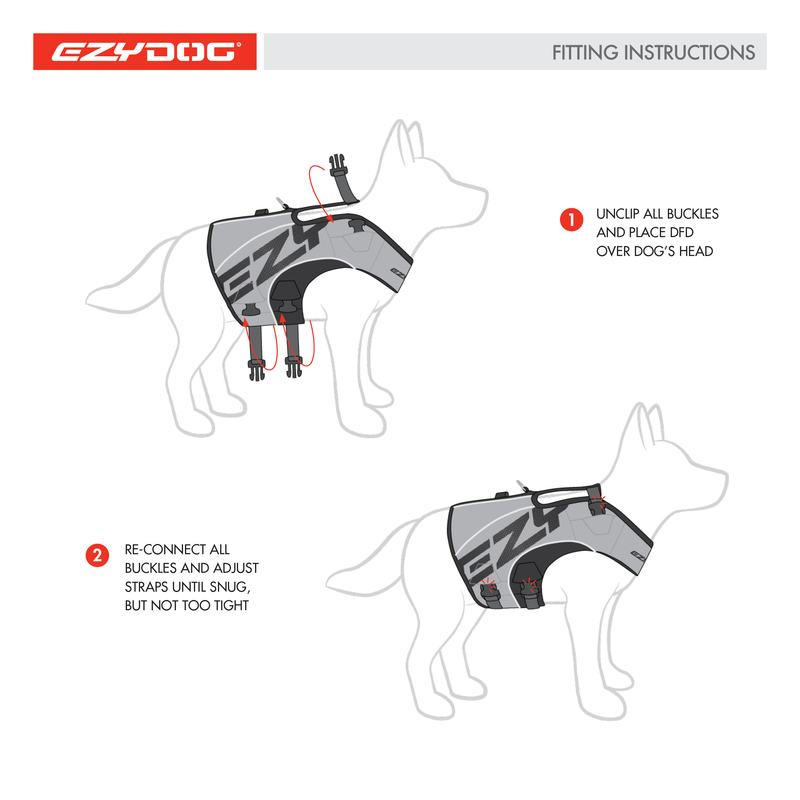 The EzyDog DFD X2 Boost is the second generation of our best selling dog life jacket, the DFD. This new design offers the same amount of floatation, with a more streamlined ergonomic fit. We know never to compromise when it comes to the water safety of our pets, so we use only the highest grades of materials in all our dog life jackets. Whether you're teaching your dog to swim or simply using it as a safety precaution, the DFD X2 Boost will help your dog stay safe around water. 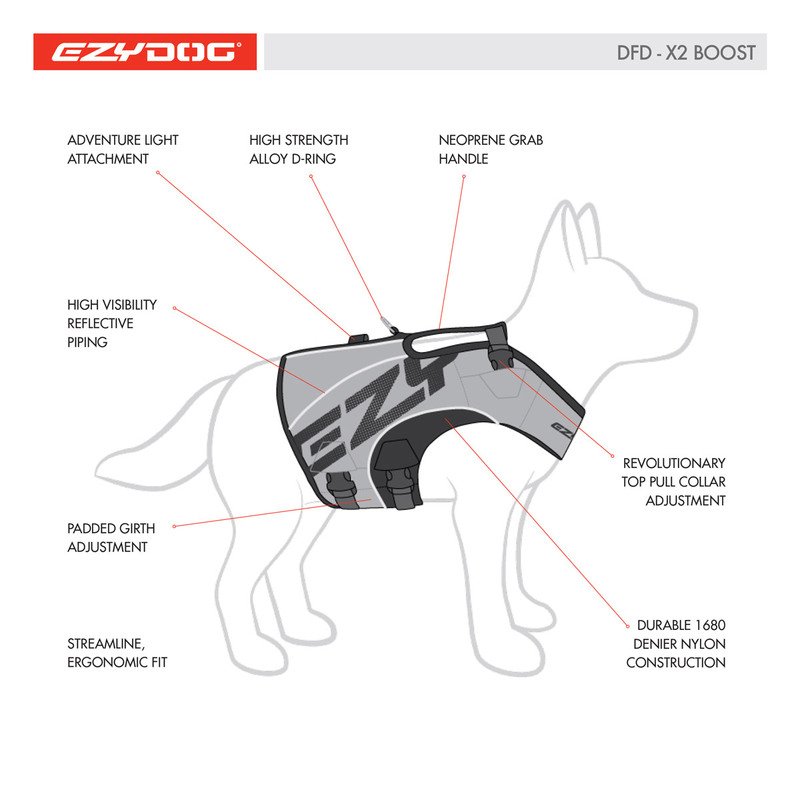 The DFD X2 Boost features a unique fixed collar adjustment system, which only has to be adjusted once. The fixed collar on the DFD X2 Boost maintains the same positioning at all times, yet still offers ample adjustment. All webbing is contained within neck strap, meaning there's no loose webbing to irritate your dog. The Ultra-Buoyant foam is strategically positioned around the vest, including the section under the dog's belly. This keeps your dog upright and in a natural swimming position at all times. Unlike other vests, the DFD does not hinder your dog's natural movement and can be fastened/removed easily and quickly. A life jacket that fits the dog's body type allows them to swim with confidence and run more freely. The geometry of the DFD X2 Boost has been meticulously crafted to fit comfortably around any dog type, with panels designed to taper to the shape of a dog's torso. A neoprene grab handle is situated at the top of the life jacket for quick control over your dog. Reflective piping is used throughout for extra visibility at night. The revolutionary neck adjustment contains buoyant foam, to help keep your dog's head above water. Why buy a Dog Float Coat? A dog swim vest has several main purposes. Recreationally for dogs that spend a lot of time in and around the water or for owners who take their dogs on boats. It's also great for dogs who struggle to swim and is recommended for use in Hydrotherapy rehabilitation. New Style D-ring - Extremely durable. 1. UNCLIP ALL BUCKLES AND PLACE DFD OVER DOG'S HEAD. 2. RE-CONNECT ALL BUCKLES AND ADJUST STRAPS UNTIL SNUG, BUT NOT TOO TIGHT. IMPORTANT: DO NOT OVER-TIGHTEN STRAPS! WHEN FITTED CORRECTLY, DFD™ SHOULD BE SNUG, BUT TWO FINGERS SHOULD EASILY RUN BETWEEN STRAPS & DOG.